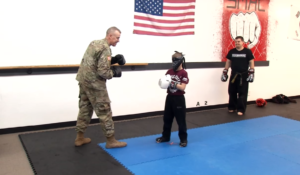 Deployed Dad Sneaks Up To Blindfolded Son At Taekwondo For Huge Surprise Homecoming. We never realize just how much the everyday moments with our loved ones mean until we have to go without them. 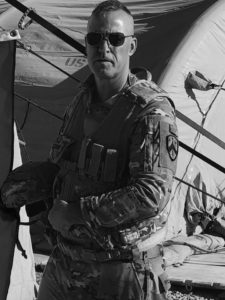 In May 2018, Staff Sgt. Rob Cesternino was deployed to Jordan and Southern Syria, serving with the Tennessee National Guard. His six children have gone through nearly a year’s worth of dinners, family activities, and nights without their beloved father. It’s been hard for all of them, but Cesternino’s youngest son, Luca, has been having an especially rough time. So when Cesternino found out he’d be returning home from active duty a few days earlier than expected, he knew it would be the perfect opportunity to make his 9-year-old’s year. With his wife Leah’s help, Cesternino plotted to surprise Luca at his taekwondo session on March 18. 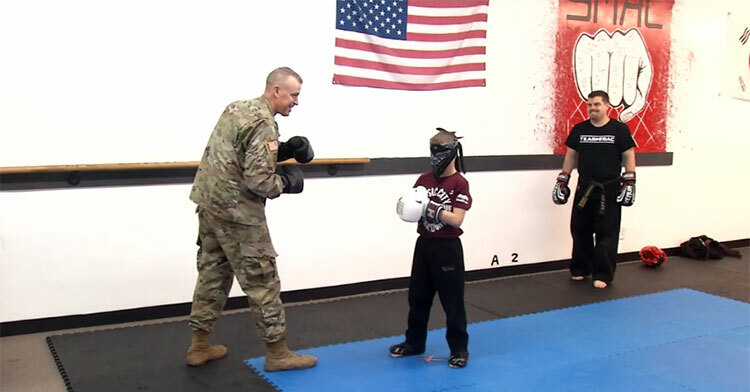 Luca was told he’d be sparring blindfolded with three different instructors… the last of which would be his dad. Luca had no idea he was throwing punches at his dad until he heard his opponent call him by his childhood nickname. Luca freezes as another person records the touching moment. “Daddy?” he asks. Then he pulls off his blindfold, looks up, and stares as his jaw drops. A split second later, Luca barrels toward Cesternino, wrapping his arms around his dad as he sobs uncontrollably. Claps and cheers ring out around the room as the two hold onto one another. “You were such a big boy when I was gone. I’m so proud of you,” Cesternino tells Luca. We’re certain his little boy is just as proud of his dad. It’s obvious how long (and how much) the father and son have been wishing for this moment. They must be so excited to make up for all that lost time. Here’s hoping they get to enjoy each other’s company as much as possible in the coming months. Watch as Luca’s regular Monday night turns into a memory he’ll always cherish. Share to celebrate Cesternino’s return and to thank him for his service.